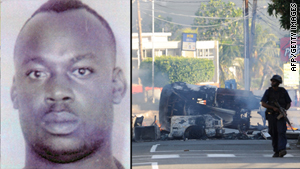 Christopher Coke, 41, rules part of Kingston via violence, corruption and philanthropy, experts say. (CNN) -- Christopher Coke's indictment has set off more than a firefight in the streets of Kingston, Jamaica; it's also sparked a diplomatic imbroglio that threatens U.S.-Jamaican relations. The United States wants Coke extradited. Jamaica's ruling party has been slow to respond, and the country's opposition and other observers say the matter is an embarrassment that could hurt Jamaica's standing in the international community. Affidavits from two confidential informants form the basis for charges that Coke, a 41-year-old accused drug kingpin, has pumped cocaine and hundreds of pounds of marijuana into the United States. One witness quoted in the affidavit said Coke used women to "body-carry," or smuggle internally, the cocaine and travel to New York under the guise of purchasing clothing for their shops in Kingston. Coke's associates said they also sent him guns packed in refrigerators, according to documents CNN obtained. A third affidavit, supplied by "John Doe," an anonymous Jamaican police officer assigned to wiretap Coke's phone conversations, has been a source of consternation for the Jamaican government. "Jamaica wishes the United States to disclose the name of the witness 'John Doe,' " Justice Minister Dorothy Lightbourne wrote in a letter last year. "Jamaica notes that there should be no concern about interference with this witness." The affidavits are part of the U.S. government's effort to have Coke extradited. The Jamaican government presented the affidavits in its own extradition proceedings, making the documents public. Coke remains at large but his former lawyer, Jamaican Sen. Tom Tavares-Finson, has denied the allegations, saying Coke "is just an ordinary Jamaican going about his everyday business, looking about himself, trying to improve the lot of his children, his family and his community, with a recognition that he has an influence." Prime Minister Bruce Golding recently issued a national apology for government involvement in hiring a lobbying firm to fend off a U.S. extradition request. He said he believed the matter was being "kept completely separate from the government," but it wasn't. On Wednesday, Golding rejected reports by media outlets that he was "a known criminal affiliate" of the suspected drug lord. He called the accusations "scurrilous." The bone of contention: Though a Jamaican court authorized wiretapping the phones of Coke and some of his associates, Jamaica says John Doe was not permitted to share information with the United States. The U.S. resisted divulging the constable's name, saying he required protection. Lightbourne responded that John Doe should face charges in Jamaica and that Jamaica could request his extradition if he is still in the United States. In his affidavit, signed May 14, 2009, John Doe says only that he had been part of a team intercepting calls between Coke and his associates since October 2004. He personally listened to calls, sometimes for eight hours a day, between April 2007 and October 2007, he said. He also said the calls referenced in one of the affidavits -- that of Cooperating Witness 1, or CW-1 -- "were recorded in Jamaica pursuant to court authorization." John Doe makes no reference to the second witness, who told authorities he was part of Coke's cocaine ring and saw nine Jamaican women make 20 drug-smuggling trips to the U.S. between 1996 and 1997. CW-1, who said he began cooperating with authorities in 2008 and pleaded guilty to firearms trafficking and drug charges, said in his affidavit that he met Coke in 2003 and knew him as "Presi," "Bossy" and "Little Wicked." He was friends with one of Coke's lieutenants, who the informant knew as "Reaggie," and often chatted with Coke in the Tivoli Gardens garrison community where the alleged drug lord holds sway. CW-1 said he entered the U.S. illegally in 2004 and went to New York. He spoke to Reaggie and Presi regularly and sent them gifts: cash, clothes, accessories, electronics and car parts among them. "I sent these items to Presi because I knew that Presi was powerful and influential among drug traffickers in the United States. I understood and expected that if I ever had a problem with my drug business in New York -- such as a problem with my customers or suppliers -- Presi would help me fix the problem," CW-1 said in the affidavit. By 2006, CW-1 said he was distributing "a few hundred pounds of marijuana" a week, and he offered to give one of Coke's "workers" marijuana at cost so profits could be sent to Coke in Jamaica. "I made this suggestion out of respect for Presi and Reaggie and to further strengthen my relationship with them," the informant said. Son of accused drug lord Lester Lloyd Coke. A New York grand jury indictment alleges that he has been involved with gun and drug trafficking since 1994. Coke was charged in August with conspiracy to distribute marijuana and cocaine, as well as conspiracy to traffic in firearms. Is he involved in gangs? The U.S. government alleges that Coke runs the Shower Posse, an outfit Coke's father was said to control before his death in 1992. Is Coke his real name? His real name is Michael Christopher Coke, but his aliases include "Paul Christopher Scott," "Presi," "General," "President," "Dudus," "Bossy," "Little Wicked" and "Shortman." He controls a Kingston neighborhood called Tivoli Gardens, which the U.S. government calls a "garrison community" barricaded and guarded by his gunmen. Coke's gang allegedly imports weapons at a wharf adjacent to the neighborhood. According to the affidavit, authorities intercepted an April 2007 call between Coke and Reaggie in which they said a New York associate named "Sky" would receive marijuana for $450 a pound. He would then sell the marijuana and send the profits to Coke. Instead, CW-1 said, he gave a second worker -- identified in the affidavit as "Rome" -- two 400-pound bundles of marijuana on consignment. The following month, CW-1 wanted to retaliate against a man who failed to pay him for 20 pounds of marijuana. He said he called Coke first because the absconder hailed from Tivoli Gardens. "Presi told me, in coded language, that I should do whatever I felt I needed to do to protect myself and my drug business," CW-1 said in the affidavit, adding that he later confronted "the customer" in the Bronx and "used violence against him in an effort to recover the money that he owed me." CW-1 told authorities that because Coke needed weapons to protect himself, he purchased three handguns: a Ruger, Desert Eagle, a 9 mm Smith & Wesson and a .380-caliber. On April 3, 2007, he drove with a friend to Sky's Philadelphia, Pennsylvania, residence and handed over the guns so they could be shipped to Coke, he said. CW-1 said in the affidavit he understood Sky would mail the weapons along with two AK-47 rifles. CW-1 said that in another conversation with one of his marijuana dealers, whom the affidavit identifies as "Kevin," they discussed how to get weapons to Coke. "Kevin told me that he had in the past sent firearms to Presi in refrigerators," CW-1 said. Court documents say Coke and Reaggie discussed the arrival of the weapons on a wiretapped call on May 8, 2007. "On this call, Presi also discusses which guns he will keep and which ones will go to other people," an affidavit said. The affidavit of Cooperating Witness 2, or CW-2, outlines the cocaine charges the U.S. has leveled against Coke. CW-2 said he considered himself "part of the American branch" of Coke's notorious Shower Posse. CW-2, who said he pleaded guilty to charges that he conspired to distribute heroin, cocaine, crack and marijuana, began cooperating with U.S. authorities in 2005, according to an affidavit. CW-2 told police he and other Jamaicans sold crack in the Bronx between 240th and 241st streets, and he first saw Coke in the area in the early 1990s. Around 1994, he met a man identified as "Mikey" at a Bronx restaurant, and Mikey introduced him to a "mule," or drug smuggler, from Tivoli Gardens, he said. "I then saw the young woman go to use the restaurant's bathroom," CW-2 told authorities. "Several hours later that same day when the restaurant was closed Mikey gave me cocaine and I cooked the cocaine into crack at the restaurant. Mikey told me that the young woman that I had seen go into the bathroom had removed the cocaine from her body." The cocaine produced almost a half-kilogram of crack, CW-2 said. About two years later, CW-2 was with a fellow crack dealer, his crack supplier (allegedly one of Coke's money handlers) and two women, one of whom sold clothes in Kingston's Arcade shopping area, allegedly controlled by Coke. Mikey told me that the young woman that I had seen go into the bathroom had removed the cocaine from her body. "The dealer explained to me that [Coke] requires that the girls who have shops in the Arcade [and who travel to New York to purchase clothing] carry between one-quarter-and-one-half of a kilogram of cocaine when they come to the United States so that the cocaine can be sold here," CW-2 said. "The dealer said that if the girls refuse to do so, then their businesses will be threatened and the clothing they sell and the money that they earn will be stolen." CW-2 continued in his affidavit, "Later that same day, the supplier provided me with approximately two to three ounces of uncooked powder cocaine. Earlier that day, when I had asked the supplier for cocaine, he didn't have any. Based on that, I concluded that he had just obtained the cocaine that he gave to me from the girl who was with the supplier when I had seen him earlier that day." The affidavits of the confidential informants were provided to the Jamaican government in an effort to expedite the extradition process. For nine months, the Jamaican government balked at approving the extradition proceedings, as the U.S. Embassy in Kingston issued letters and diplomatic notes assuring no laws or treaties were violated during the investigation. U.S. envoy Isiah Parnell assured Jamaican officials in December that Coke would receive a fair trial and have an opportunity to face his accusers. A February diplomatic note stated that Coke's case "is among the strongest extradition cases that the United States has made to the government of Jamaica." After months of wrangling, Prime Minister Golding earlier this month said he would let the courts handle the matter, setting off this week's violent police clashes with Coke's gang members and their supporters in the Jamaican capital. It appears Coke may have been aware that an indictment was coming well before its issuance last year. According to an affidavit, an intercepted call in October 2007 caught Coke telling an associate, Omar, "They're coming out with an indictment. ... They're saying that one is going to be there for me, too."